When losing weight, some healthy food swaps for weight loss can really make all the difference! Many people have tried to lose weight at some point. But very often, people fail in shedding pounds and the cause is usually that they weren’t able to stick to their diet. Maybe you can’t imagine spending your day without having sour cream, breakfast cereal, flour, etc. I get it! I’ve been there myself. And I’ve failed various times in losing weight. They either drastically change their diet by excluding every single unhealthy product which causes them to give up very fast because it’s too hard. Another thing people do is they continue to eat the unhealthy products and think it’s fine but end up not losing any weight at all. 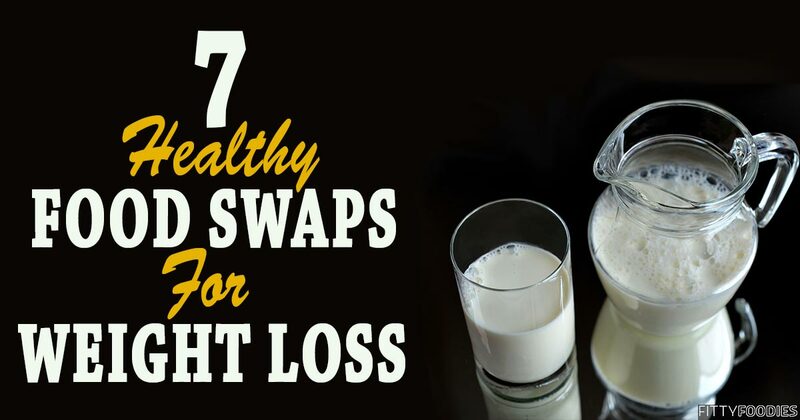 A way to avoid making these mistakes is by using food swaps for weight loss! This way, you won’t need to sacrifice many of your favorite products and continue to have slightly different versions of them! Plus, this way you will cut calories and practice healthy habits by eating healthy food substitutes. Over the years, I’ve learned some great food swaps for weight loss which made my weight loss journey 100 times easier and now I’d like to share them with you! Hopefully, they will make your dieting journey easier too and healthy eating won’t look as bad as you may think. There are some meals you just can’t imagine having without sour cream. And you’ve probably heard that it’s bad for weight loss but continue to have it because it’s too hard to stop. And you may think, how bad can sour cream really be? Well, there are actually over 200 calories and 20 grams of fat (about 13 of which are saturated). Those are huge amounts to have when you’re losing weight! I know it can be very hard to just stop having something like sour cream in your meals. But Greek yogurt is the perfect alternative! Greek yogurt has just about 60 calories and 2 grams of fat in 100 grams! The two are very similar in taste and price! So it’s definitely one of the most healthy and useful food swaps for weight loss! You may be thinking: but how can I switch something as delicious as cereal to oatmeal? Well, read on to find out why to make the switch and how to make it as easy as possible! Cereal has become a very popular breakfast option over the years. It’s very convenient because it tastes good and takes almost no time to make. Plus, a lot of breakfast cereals are advertised as super healthy and great for weight loss which leads people to think that’s true right away. Well, most of these cereals are deceiving and actually contain very high amounts of sugar which is super bad for your diet as it leads to direct fat gain! That’s why it’s a good idea to stop having breakfast cereal during your diet. Instead, try some oatmeal! I know it may sound like a drastic swap to make but it’s definitely worth it. First of all, oatmeal is high in fiber which is great for your digestive system. And, oats have a low glycemic index which means that the rate at which it converts into fat in your body is very low, unlike breakfast cereal. The problem is, many people view oatmeal as a gross and tasteless breakfast option. But it doesn’t HAVE to be this way if you improvise! Try having your oatmeal with some calorie-free flavor drops. Or try adding some fruits, cinnamon, or add a few drops of lemon! There are countless options to pump up the flavor of your morning oatmeal and make it taste even better than cereal! Healthy foods can really taste great – you just have to find what works for you. Many people love potatoes and french fries and would never just stop eating them. But sweet potatoes are actually a healthier and, for some, more delicious alternative! Sweet potatoes and regular potatoes do have a similar amount of calories. But the glycemic index (the rate at which carbs convert into fat in your body) is very different. The sweet potato’s glycemic index is 46 in comparison to close to 100 of the regular potato! That means that eating regular potatoes is almost equivalent to having plain sugar because of how fast it’s turned into body fat. So definitely try out sweet potatoes. You can even bake some delicious sweet potato fries in the oven which I personally find more delicious than regular french fries! There are so many salad dressings and sauces everyone loves which are made with lots of mayonnaise. 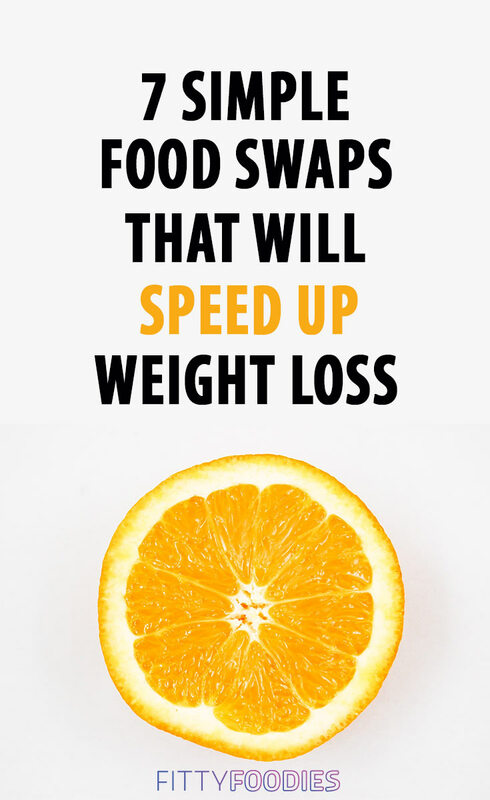 That’s why this is one of the most useful food swaps for weight loss. Mayonnaise has about 700 calories and 75 grams of fat in just 100 grams of the product! It’s really hard to imagine this huge density of calories and fat! But just imagine how terrible it is for weight loss and how it completely slows down the process. But you can swap mayonnaise with mashed avocados which, compared to mayonnaise, only have 160 calories and 15 grams of fat in 100 grams! Of course, this is still a fairly high calorie density and you shouldn’t have too many avocados when losing weight either! But still, avocados are very healthy and are full of vitamins and nutrients which makes them a very healthy alternative! It’s hard to find recipes which don’t require any flour these days which is why many people find it difficult to find recipes for meals suitable for weight loss. Although regular flour is bad for weight loss as it converts into sugar very quickly in your body, there are some great substitutions! My personal favorite is ground oats. They have fewer calories, a lower glycemic index, and taste very similar to wheat flour! Breadcrumbs are sometimes the most important ingredient for some meals which makes it difficult to cut them out completely. But breadcrumbs are very high in calories and your body reacts to it similarly to sugar. But crushed nuts are a great swap for breadcrumbs! I’ve tried them out myself and they fit the slot in perfectly. Although nuts are pretty high in calories, they do have a lot of vitamins and minerals and even a few nuts can be very beneficial for your weight loss diet! To some, cow milk is a very important part of their diets. But when losing weight, this milk isn’t the best option as it is high in calories (over 100 calories per cup), saturated fats and it also has sugar. Unsweetened almond milk, on the other hand, contains almost no sugar, no saturated fats, is lactose-free and low in calories compared to cow milk (only 40 calories a cup). And there you have it! 7 healthy food alternatives for faster weight loss. So these were some of my favorite food swaps for weight loss. These substitutes are great because they keep you from sacrificing some your favorite meals! I really recommend you try them out because I’m sure they will make your weight loss journey much easier! However, if you’re having trouble losing weight or don’t really know how to lose weight, you may want to consider making a one-time investment in a weight loss program. If you are searching for your final weight loss solution and have had enough of researching weight loss information online – we have just the plan for you. The 15 Day Di.et Plan offers all of the weight loss information you need in one place and as a result – you will lose up to 15 pounds in nearly two weeks! Not to mention, you will also feel noticeably better, you will get rid of those annoying aches and pains all over your body, reduce the appearance of cellulite, look younger, and you will take a huge step towards a happier and healthier you! Are you ready for your final weight loss solution?